I'm always asked the question, "You've never been there before???". Generally, this is said with disbelief and much fervor. Okay, yes, there are some spots that I really should've visited in the past few years, but think about how many restaurants you haven't been to in the GVRD. Yes, there is only that much time, money and effort to eat at every conceivable place in town. 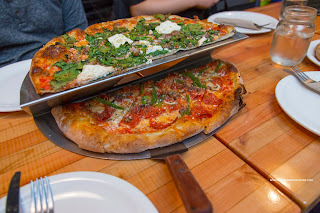 So it wasn't until recently that I got to sit down at Ragazzi Pizza for a meal with the fam and also Costanza's family too (I've had it for takeout before, but it's not the same). 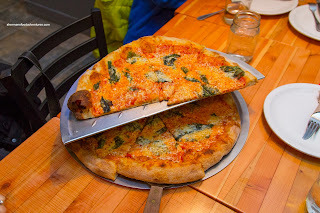 We ended up getting the Margherita for the kiddies which was served in a 2-tiered serving tray. Marginally blistered (only the one you see in the picture), the crust was crispy, but not as charred as I would've liked. However, the dough was still seasoned nicely and had an appealing chewiness. The tomato sauce was pretty tasty with a mild tang while there was a good amount of cheese. I would've liked to see the basil added after the fact as it was pretty cooked. For the adults, we ordered one each of the Spaccanapoli and Mangiacake. 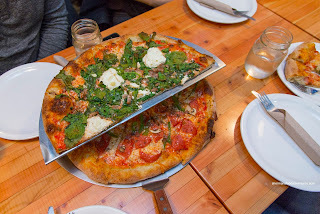 They split it into 2 trays each with the Spaccanapoli on top consisting of sausage, spinach and ricotta. This was rather mild due to the ingredients involved (sausage was not the spicy variety, but did have a nice fennel aroma). The globs of ricotta were a treat as there was a creaminess added to each bite. On the other hand, the mangiacake was more flavourful due to the inclusion of pepperoni, mushroom, green pepper and ground beef. This ate both meatier and somewhat spicier as a result. I found the crust held up to the ample ingredients quite well as no parts were soggy. Based on my previous takeout experience and the Pizzapalooza visit shortly after this visit, I believe Ragazzi makes a solid thin-crust pizza that stands up to the other spots in town. 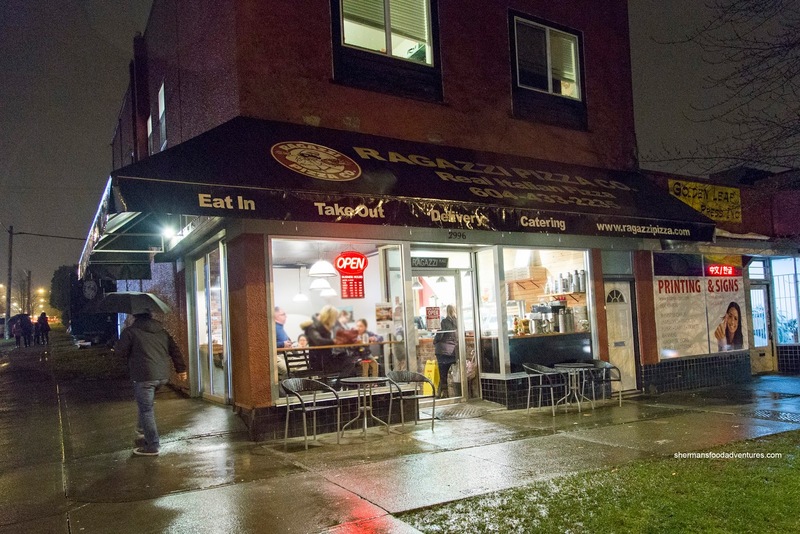 Don't forget Ragazzi is the progenitor of Via Revere and Straight Outta Brooklyn.